This is one of my favorite case studies to talk about, because it was one of the first validations we got that showed the potential of our approach to impact the drug development cycle. The story of the imipridones and ONC201 began in 2009 when ONC201 was identified from a phenotypic screen for TRAIL-inducing compounds (Allen et al, 2011). Now we can spend ages discussing the pros and cons of phenotypic vs target-based screening approaches (spoiler: I'm a big supporter for phenotypic screening based approaches), but one of the biggest challenges for compounds identified from a phenotypic screen is that often theres no clear target or mechanism of action that is known. This was the case for ONC201. Fast forward to 2016. ONC201 and other members of the imipridone compound family had been licensed to Oncoceutics Inc and ONC201 was in multiple Phase II clinical trials for advanced cancers. However the direct binding target was still unknown, which made patient/disease selection difficult and made further clinical development difficult. Luckily this was the point where Josh (VP of Research at Oncoceutics) and I happened to meet at AACR where we were presenting one of the earlier pieces of our platform, and a few meetings later we agreed to try out our platform to see if we could help identify the target and mechanism of ONC201. Now, Oncoceutics had tried other target deconvolution methods (including structure based computational approaches), but none of the targets that were predicted through these methods had panned out, so this seemed like the perfect opportunity to test out our AI approach that makes predictions based on many different data types instead of just one. Using the structure of ONC201, cell-line based efficacy screens, and post-treatment transcriptional changes, our platform compared data on ONC201 to the millions of compounds in our database using a Bayesian machine learning approach and predicted the top binding target of ONC201 to be DRD2. 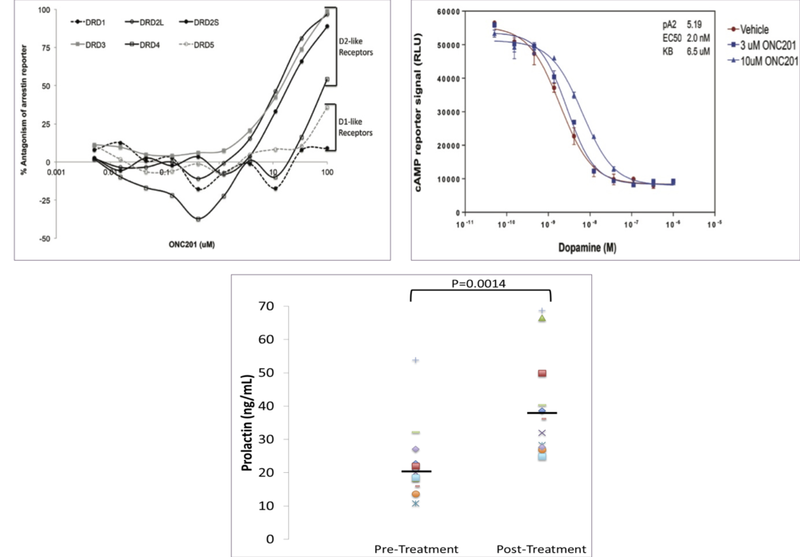 DRD2 is a dopamine receptor that, at this point, was not considered an anti-cancer target, and we were a bit skeptical of the prediction. However when this was tested it turned out that DRD2 was a validated binding target of ONC201. We saw confirmatory results not only in direct target based assays, but also in levels of prolactin (downstream effect of DRD2 antagonism) in patients treated with ONC201. Additionally we observed that ONC201 was a highly selective binder of D2-like receptors vs other dopamine receptors which correlated with our initial prediction. 1) Analog Selection – The chemistry team at Oncoceutics had created many different imipridone analogs, and we wanted to apply our platform to see if we could rank these analogs for future development. There are two types of dopamine receptors: D1 receptors (DRD1, DRD4, DRD5) and D2 (DRD2, DRD3) and interestingly they act opposite to one another. We had seen that antagonism of DRD2 was important to ONC201's anti-cancer efficacy, and we hypothesized that the best analogs would selectively bind D2 but not D1 receptors. Using our platform we ranked all analogs based on the predicted selectively to D2 receptors vs D1 receptors, and found that when we tested those compounds against a cell line panel, our predicted rankings significantly correlated with measured efficacy. Diving deeper into the imipridone family, we focused on two analogs that had already shown some efficacy in cell-based experiments – ONC206 and ONC212. We ran data from both compounds through our platform, and despite both compounds seeming relatively similar structurally, our platform predicted ONC206 to be a strong binder of DRD2 (stronger than ONC201) whereas ONC212 was not predicted to bind any of the dopamine receptors or even any tested G protein coupled receptor. When we tested these in a GPCR panel, this result was confirmed and we found that ONC206 was a highly selective DRD2 binder while ONC212 actually targeted an orphan GPCR that hadn't been targeted clinically before. 2) Cancer Subtype Positioning – The next thing we wanted to explore is how we could use our platform to pinpoint particular cancer subtypes where ONC201 was more likely to be efficacious. Part of the OneThree database in genomic data on thousands of different cancer cells and patients. Using this, our platform did two things: 1) integrate expression and mutation data to identify cancer types where DRD2 is highly dysregulated compared to normal tissues and 2) computationally simulate a CRISPR screen for each cancer type to predict whether the loss of DRD2 was likely to cause cell death or a severe decrease in fitness (see ECLIPSE post). Based on this analysis we identified pheochromocytoma and glioblastoma as top indications for ONC201. When tested against cell line models we observed that, as predicted, ONC201 was efficacious in GBM and the PC12 pheo cell line (GI50 = ~1.5µM) . Additionally, we observed that ONC206, a stronger DRD2 binder than ONC201, was more efficacious in the pheo cell lines (GI50 = 200nm), supporting our prediction that DRD2 targeting was important to efficacy in these indications. Phase II clinical trials to further test pheochromacytoma and rare gliomas as a top indication are currently ongoing (NCT03034200), with early results looking quite promising!